GARDEN OF THE DEAD (1972) Phil Kenneally, Duncan McLeod, Susan Charney, John Dullaghan. They don't make 'em like this anymore. 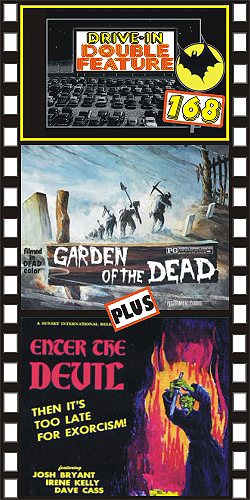 Garden of the Dead is a wonderful piece of drive-in schlock that, if you don't take it to seriously, leaves you with a big smile on your face. The story is rather unique. Chain gang convicts make the mistake of sniffing a new, experimental formaldehyde to get high. They then try to escape and are shot dead by the guards. After they're buried, they crawl out of their graves to seek a bloodthirsty revenge. What these boys can do with shovels and hoes is pretty grim. The climax to this film was always kind of fun, schlocky, but fun. "Show us the Girl!" Great color, from 35mm. PLUS: ENTER THE DEVIL (1972) Irene Kelly, Josh Bryant, David Cass, Carle Benson. People are disappearing in the desert near the Texas border. A brave (and beautiful) occult expert comes to a lonely town and finds a Penitentes-style devil-cult. Her investigations lead to terrible danger. This film really succeeds in establishing a lonely sense of horror in an isolated, far off country town Some horrific rattlesnake scenes that bring to mind the climax of The Sadist. An unknown cast shines. Color, 16mm.